While the entire nation is familiar with the award-winning Tillamook cheeses, here in the Pacific Northwest we have the added benefit of enjoying their more than 40 offerings of ice cream. "Our ice cream is limited to the Pacific Northwest, so that's why we feature it in our visitor center," said Susan Palmer, director of retail operations at the Tillamook Cheese Factory. Palmer said the 30,000-square-foot visitor center greets nearly a million visitors a year and most of them check out the ice cream counter. How could they not? With the smell of freshly-baked waffle cones drifting through the air inside the center. If you want to try more than just a double scoop, insulated bags are sold so you can take a sampling with you. But the factory is more than just a way to satisfy your sweet tooth, it also can be a learning experience. Taking a walking tour on the second floor of the facility gives you a bird's eye view on how cheese is made. You can look down on the production floor through big windows where cheese is processed, inspected and packaged. "A lot of people miss the two kiosks we have upstairs," Palmer said. "They have touch screen televisions that give people lessons on how we make the cheese and the history of the cooperative. You can spend a lot of time up there if you are interested in what we do here." Palmer said that the information booths teach visitors how milk from cows throughout the Tillamook basin is used in their products and shows you things that you can see by just looking down at the vats. "It's a very cool feature if you have the time to spend learning about what we do here," she said. "They are fairly new and we want to show people what we do here and how our products are made." All that learning can make a visitor hungry, so not only can you enjoy ice cream, but also the many cheese products that have made the city synonymous with the dairy product. Near the back corner of the visitor center is a tasting window and shelves upon shelves of the many cheeses the company produces. In addition they also have the Farmhouse Café, if you are looking for more of a traditional meal than just cheese and ice cream. While cheese, ice cream and everything dairy is the focus of the visitor's center, make sure you take the time to stop by their gift shop. "Many people have commented how our gift shop has some very unique offerings," Palmer said. "We try to make it different for people with a farm theme." Hats, games, puzzles, statues and everything in between are offered in the gift shop. You can even get a hat that looks like a cow's head for the kids. 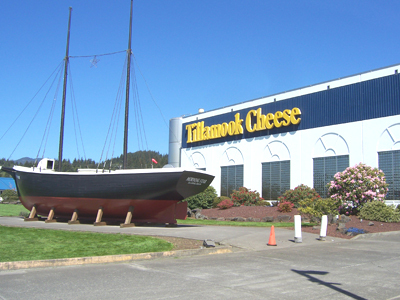 About the Tillamook Cheese Factory: The factory is run by the Tillamook County Creamery Association that is a farmer-owned cooperative that was established in 1909. The visitor center opened in 1966 and is one of the most popular tourist attractions in the state with nearly a million visitors a year. The visitor center is ADA compliant and there is RV parking available on site. Tips: Make sure that you wear comfortable shoes when visiting the Tillamook Cheese Factory, and give yourself some extra time. During the summer months the visitor center is packed to capacity from people looking to escape the heat and enjoy the dairy offerings. What to bring: Your appetite, as there are a number of food offerings at the factory. Flash cameras don't work too well when trying to get pictures of the cheese-making process, so make sure you are familiar with how you camera works in low-light conditions. Season: The visitor center is open year-round. From Labor Day through Mid-June hours are 8 a.m. to 6 p.m. daily. From mid-June through Labor Day hours are 8 a.m. to 8 p.m. daily. The center is closed Christmas and Thanksgiving. There is no fee for entering the visitor center. Getting there: Located at 4175 Highway 101 north of Tillamook.